The process of mountain building thrusts rock up to the surface of Earth. There, the rock is exposed to weathering. Weathering is the process that breaks down rock and other substances at Earth’s surface. The forces of weathering break rocks into smaller and smaller pieces. Then the forces of erosion carry the pieces away. Erosion (ee roh zhun) is the removal of rock particles by wind, water, ice, or gravity. Weathering and erosion work together continuously to wear down and carry away the rocks at Earth’s surface. A mudflow is a spectacular example of erosion. Erosion is the process by which natural forces move weathered rock and soil from one place to another. You may have seen water carrying soil and gravel down a driveway after it rains. That’s an example of erosion. A mudflow is a very rapid type of erosion. Other types of erosion move soil and rock more slowly. Gravity, running water, glaciers, waves, and wind are all causes, or agents, of erosion. In geology, an agent is a force or material that causes a change in Earth’s surface. The material moved by erosion is sediment. Sediment may consist of pieces of rock or soil or the remains of plants and animals. Both weathering and erosion produce sediment. Deposition occurs where the agents of erosion, deposit, or lay down, sediment. Deposition changes the shape of the land. You may have watched a playing child who picked up several toys, carried them across a room, and then put them down. This child was acting something like an agent of erosion and deposition. Weathering, erosion, and deposition act together in a cycle that wears down and builds up Earth’s surface. Erosion and deposition are at work everywhere on Earth. As a mountain wears down in one place, new landforms build up in other places. The cycle of erosion and deposition is never-ending. As water moves, it carries sediments with it. Any time moving water slows down, it drops, or deposits, some of the sediment. As the water slows down, fine particles fall to the river’s bed. Larger stones quit rolling and sliding. Deposition creates landforms such as alluvial fans and deltas. It can also add soil to a river’s flood plain. You can see these and other features shaped by rivers and streams. Where a stream flows out of a steep, narrow mountain valley, the stream suddenly becomes wider and shallower. The water slows down. Here sediments are deposited in an alluvial fan. An alluvial fan is a wide, sloping deposit of sediment formed where a stream leaves a mountain range. As its name suggests, this deposit is shaped like a fan. 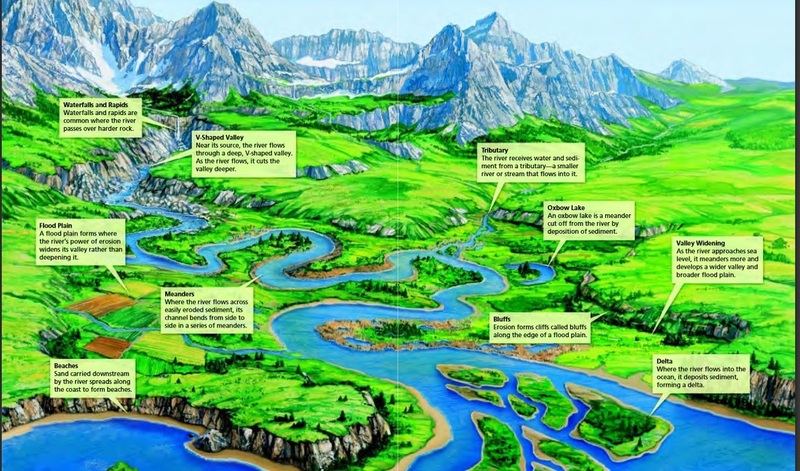 A river ends its journey when it flows into a still body of water, such as an ocean or a lake. Because the river water is no longer flowing downhill, the water slows down. At this point, the sediment in the water drops to the bottom. Sediment deposited where a river flows into an ocean or lake builds up a landform called a delta.